Compressed air drives your company. Consequently, choosing the right compressor is crucial. Going for our DRA IVR range of highly efficient oil-injected screw compressors is a choice you will not regret. The DRA IVR range grants very low specific energy requirements and one of the widest turndowns of its category. 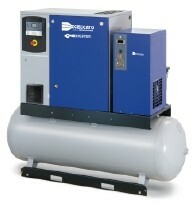 These compressors closely follow the air demand by automatically adjusting their motor speed. Combined with the innovative design of their direct driven transmission, this results in up to 35% of energy savings and drastically cuts down the lifecycle cost by up to 25%.